This post is part of our special coverage Languages and the Internet . The Portuguese language , spoken by more than 200 million people around the world, has often been described as the “fatherland” or “motherland” of the Portuguese-speaking world. On February 21 we commemorated International Mother Language Day , established by UNESCO in 1999. 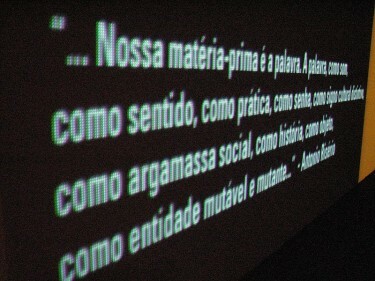 In a tribute to the Portuguese language in all its linguistic and cultural diversity, we invite you in this article to navigate through reflections from Portuguese-speaking bloggers, prompted by their reading of the first novel dedicated to the Portuguese language  [pt], Milagrário Pessoal – the most recent work by the Angolan author José Eduardo Agualusa . uma declaração de amor à língua portuguesa, na sua multiplicidade de falares (…) uma viagem pela história da nossa língua, pelos locais e culturas que alimentaram a sua enorme riqueza. a declaration of love to the Portuguese language, in all its variations (…) a journey through the history of our language, through the places and cultures which feed its great richness. O português é uma construção conjunta de toda a gente que fala português e isso é que faz dele uma língua tão interessante, com tanta elegância, elasticidade e plasticidade. The Portuguese language is a combination of all the people who speak Portuguese and it is this which makes it such an interesting language, with such great elegance, elasticity and plasticity. 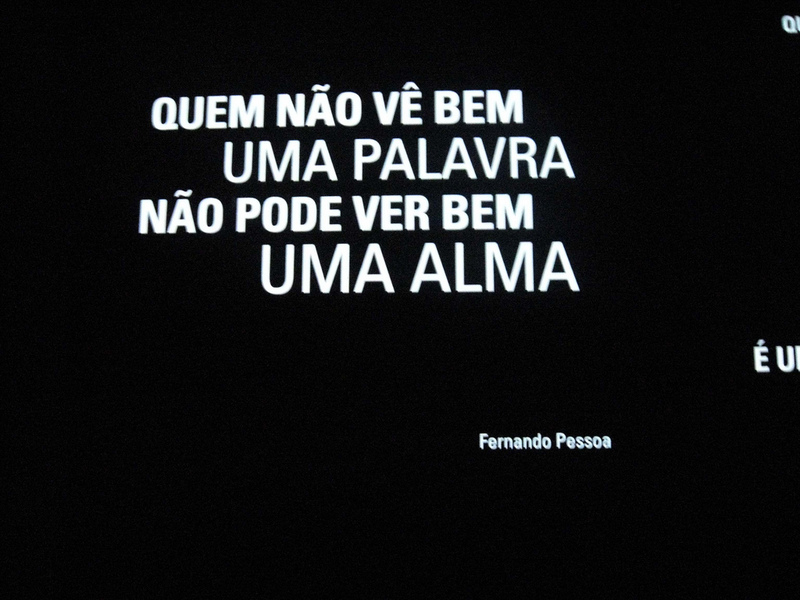 The novel – or the “essay on the Portuguese language disguised as a novel”, as the journalist Pedro Mexia describes it in a critique entitled Politics of Language  [pt] – simultaneously tells a love story and explores the processes of construction of the Portuguese language. Agualusa, again in the afore-mentioned interview, confesses to “greatly regretting the disappearance of certain beautiful words which fall out of usage” and shares the necessity and “obligation to prevent the death of these words”. através de uma busca, por parte das suas principais personagens, dos neologismos do português. E bem encaixados no meio da história (…) surgem os neologismos, como uma aula na qual nem se repara, mas onde tudo se aprende. De Portugal a Angola, passando pelo Brasil e outros, corremos os olhos por jogos de palavras (novas e velhas, dependendo por vezes da geografia) bem lançados por Agualusa. 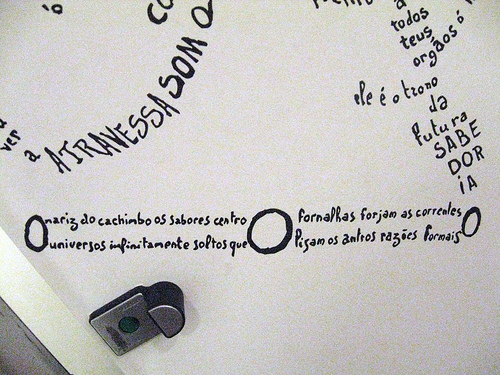 through a search by the novel's main characters for Portuguese neologisms. And neatly embedded in the middle of the story (…) we find the neologisms, as if in a lesson we don't even notice, but in which we learn everything. From Portugal to Angola, via Brazil and other countries, our eyes run over word games (both new and old, depending at times on the geographical situation) cleverly thrown in by Agualusa. Palavras também são poder, política no sentido mais lato. Podem significar insubmissão, como no caso do timorense que declamava sonetos de Camões. Podem significar afirmação nacionalista, como no caso das elites brasileiras que passaram a utilizar apelidos de origem tupi. Podem significar subversão, como o colonizado que pretende colonizar a língua do colonizador para assim o dominar. Words are also power, politics in the broadest sense. 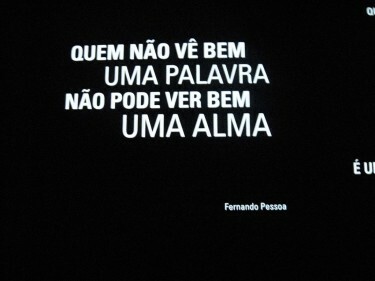 They can reflect disobedience, as in the case of the Timorian who recited sonnets from Camões. They can reflect nationalist affirmations, as in the case of the Brazilian elites who began to use nicknames of Tupi origin. They can reflect subversion, like the colonised who seek to colonise the language of the coloniser in order to dominate him. O romance contém pistas preciosas para uma política da língua, que merecem a atenção dos cientistas sociais, dos linguistas e dos responsáveis pela política da língua portuguesa. The novel contains precious clues for a policy on language, which deserve the attention of social scientists, linguists and those responsible for policy relating to the Portuguese language. 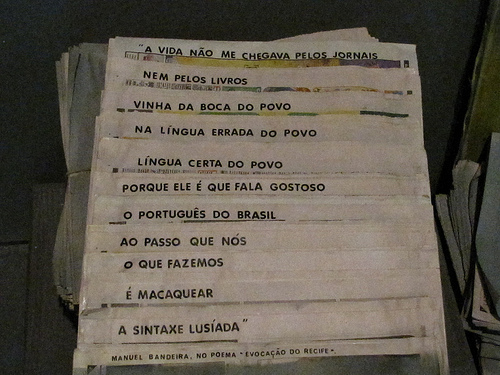 Poem by Manuel Bandeira: Life did not come to me through newspapers nor through books/It came from the mouth of the people in the incorrect language of the people/Correct language of the people/Because it is the people who delight in speaking the Portuguese of Brazil/While in the meantime/What we are doing/Is mimic/The Portuguese syntax. Photo by Capitu on Flickr. CC BY-NC-SA 2.0. Nunca como agora houve tanto movimento de pessoas e ideias entre todos os países de língua portuguesa. (…) E isso faz com que a língua se aproxime. Never before has there been such a degree of movement of people and ideas between Portuguese-speaking countries. (…) And this means that the language comes closer together. Um tesouro guardado não numa arca estanque dos povos que dele fazem uso (portanto, que falam essa Língua, o português), antes um tesouro que na sua diversidade geográfica e crescimento contínuo mais se enriquece e inflaciona. Em suma: a identidade da língua é múltipla, e tal facto não representa senão um acrescento, jamais uma subtracção. A língua é elástica, corpo vivo que se alimenta do tempo e dos tempos. A língua é uma contínua viagem de navegação por mares a cada dia nunca antes vistos ou adentrados. A treasure held not in a chest sealed from the peoples who use it (thus, who speak this language, or Portuguese), but a treasure which in its geographic diversity and continual growth becomes richer and broader. In short: the language has multiple identities, and this fact can only represent an addition, never a subtraction. Language is elastic, a living body which feeds off time and times. Language is a continual voyage through oceans never before seen or sailed. Paula Góes  contributed to the illustration of this article. All photos were taken from the Museum of the Portuguese Language , in São Paulo, Brazil.